They told TSYS it couldn't build a tech company in Columbus; it proved them wrong. The long and winding road to Georgia’s payments preeminence. Click to expand and see the life-cycle of Georgia’s giants. Deep beneath what’s now the American Cancer Society building in downtown Atlanta is a cluster of giant cables routing bits and bytes throughout the world. Coursing through the pipes, amid all the corporate emails, funny cat videos and social media posts are tightly encrypted packets of information that constitute the collective nucleus of modern commerce: electronic payments. The building, built in 1989 as a technology center, helped fuel what some say was a glut in network capacity in Atlanta, miles of unused “dark fiber” that took some 20 years to fill with data by some estimates. Today, the ACS building alone houses 128,000 square feet of data centers with plenty of room to spare. One myth surrounding the origins of the transaction processing industry in Atlanta is that the city’s ample telecommunications infrastructure, built logically along the same right-of-ways as the railroads that created Atlanta, played a key role in its growth. After all, electronic payments is all about using software to direct information across physical cables, switches, routers and telephone lines — the web of connections that allow your credit or debit card to be authorized within seconds of a swipe. “That’s really what transaction processing is — it’s telecom without the voice. All we’re doing is shuttling, transporting payment data,” says Wayne Johnson, an analyst at Raymond James Financial in Atlanta who covers the processing industry. But while the infrastructure didn’t hurt, industry players are reluctant to draw a straight line between those wires and the prevalence of an industry cluster that supports thousands of jobs in Georgia today. Payments needed early visionaries, and experts agree that it was a mix of talent, technology and timing that drove things forward. The first credit card had been issued by Diners Club International in the 1950s, followed by department store and gas company charge cards. In Atlanta, it took awhile for the attention to turn toward plastic, as banks at the time were swimming in paper: checks that transferred value between customers and companies. The Federal Reserve Bank of Atlanta, which covered the sixth district encompassing Georgia, Alabama, Florida and parts of other Southern states, had built up its check settlement operations just as regional banks had built massive processing centers to handle the deluge of paper that came in daily via airmail and truck. “Suddenly large amounts of checks were being written in the Southeast as the population exploded, and, in fact, the sixth Federal Reserve district became over time the largest check volume district in the United States,” said Rich Oliver, a retired executive vice president and retail payments expert for the Atlanta Fed. Meanwhile, the Federal Reserve Bank of San Francisco had worked with its local banks to formulate the Automated Clearing House, or ACH, a software system that could cut out the need to create checks for recurring payments. Instead, an account could now be directly debited, reducing the time, expense and human error of the existing process. “The paper-based process was expensive, and it was at times clumsy and it was prone to error,” Mr. Oliver said, noting that all along, Atlanta was watching what was happening out West. “The senior bankers here took notice. 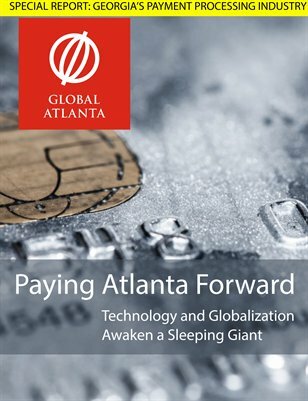 They said, ‘You know, That idea is really sharp.’” They worked with the Atlanta Fed to create the Georgia Automated Clearing House Association, or GACHA, the second such association in the country. Because it was dealing with competitive private banks, the Fed by default became the convener and the central hub for the software systems that made the ACH work. But the process didn’t immediately jump from paper to phone lines: Automated clearing was first done through the existing courier networks, with trucks delivering both paper checks and vouchers as well as eight-inch reels of magnetic tape to be read by computers at the few bank processing centers that already had them. “There was a lot of paper and printing involved in the early days of electronic payments, but that’s just what needed to happen to transition over time,” said Mr. Oliver, who became the second ACH administrator at the Atlanta Fed just a year after earning a graduate degree in computer science at Georgia Tech. Atlanta’s activity caught the attention of the government, which led to and even bigger win for ACH: its selection as the pilot site for direct deposits of U.S. Air Force salaries. It was later chosen for Social Security checks (Florida, with its army of retirees, was in the Atlanta Fed’s district). Those developments brought the scale that the program needed, providing the larger “backbone” that companies and banks used to offer the service to their employees and customers, Mr. Oliver said. There were all kinds of uses: Banks could more easily clear payments. Insurance companies automatically deducted premiums. Even health clubs loved it, Mr. Oliver said, because they could make new customers sign a direct-debit agreement rather than trying to track down cash after that New Year’s resolve wore off. But the ACH didn’t happen by chance. Brown Rawlings, an Atlanta Fed senior vice president, had struck an alliance with Professor Paul Han at Georgia Tech, who needed a set of banks to test out a machine he was developing for electronic check processing. Mr. Rawlings, now regarded as a visionary in electronic payments, shepherded Dr. Han’s idea through the Fed’s Board of Governors, and Georgia and Florida banks were chosen for the pilot. The first two phases of what became known as the Atlanta Payments Project were completed by 1970, bolstering the creation of the second ACH in the country. But that was only half of four phases the board had funded. Phase III was set to take a comprehensive look at the future of electronic banking, and Phase IV would dive into the technology around debit cards. One problem: Dr. Han suddenly died in 1971. Allen Lipis, then a 31-year-old New York banker, came to Atlanta in May of that year on “temporary” loan from his employer, the bank that would become Citibank. It quickly became evident to him that the project would require more than Georgia Tech graduate students. Despite being competitors, four of the five largest banks in town sent two senior researchers each to the effort, supported by three people from the Atlanta Fed and three consultants Dr. Lipis hired, he told Global Atlanta. “Whatever the Fed asked for, the banks in town supported,” he said. They created a 1,300-page study on electronic funds transfer, focusing on the ACH. The study suggested that while checks would continue to be a mainstay of the payments system, 30 percent of their volume could be removed through the system’s implementation. Atlanta became a center for expertise around electronic banking, a sector that was changing faster than executives and regulators could keep up on their own. “The enthusiasm that was generated within our study started to filter out across the country, and we had people who were calling me all the time and saying, ‘I want to spend a day and learn about what you’re doing,’” Dr. Lipis said. At that time, many of the digital services taken for granted today were still in their embryonic stages. ATMs were brand new, and First National Bank of Atlanta made a splash in that technology with its famous Tillie the Teller, a friendly female face attached to the ATM in 1974 to personalize what amounted to a computer in a wall. Regulators for awhile were stumped as to whether ATMs constituted bank branches (eventually arriving at “no” because they didn’t make loans). Interbank debit networks, allowing cash withdrawals from any ATM with a MAC, Pulse or Star logo, for instance, was still a long way off, Dr. Lipis said. Credit card networks were also still nascent, and debit cards would really come together only in the 1990s (slower than they would have, Dr. Lipis believes, if the Fed would have agreed to take a more active role). While waiting to hear whether the Fed would operate a central switch for debit systems, First National Bank issued the Honest Face card, which gave Atlanta supermarkets the assurance that a check cashed by a card-holding customer would be backed up by the bank. That put a damper on the interbank cooperation that had been central to the payments project. As the “loaned” bankers involved returned to their institutions, the team funded itself by selling reports and access to conferences that helped people stay abreast of the industry. That spawned a series of consultancies in payments and banking research. Dr. Lipis himself, though initially slated to head back to New York, had settled in Atlanta and continued working in the field. He first struck out on his own, later joining Bank Earnings International, a major force in the industry created by Jim Cotton and Jerry Eickhoff. “There were a lot of very knowledgeable people on payment systems that began to emerge from Atlanta. You start with a little nucleus, and that nucleus trains other people, and other people think they can start their own companies, and so it began to grow, and over a period of 20 years you have maybe six to 10 different companies that emerged because they had the knowledge,” Dr. Lipis said. That intellectual capital — and its decision to park in Atlanta — is in longtime Atlanta technology attorney John Yates’s mind the essential ingredient to Atlanta’s rise as a payments center. “The beauty of Atlanta is that people come to Atlanta and stay in Atlanta; that’s been one of our largest, most significant assets: We’re like fly paper,” Mr. Yates of Morris, Manning & Martin LLP told Global Atlanta. But it didn’t happen in a vacuum; the evolution of banking regulations had a role to play. “Literally on every street corner … you’d have four different banks, and they were not your major banks. They were local or state-oriented banks. We had more banks in this community than you could shake a stick at at that point in time. ” Mr. Yates said. North Carolina opened up its laws to allow intrastate consolidation among banks, leading to the creation of “mega banks” that began looking at Georgia’s many smaller institutions as acquisition targets. In 1985 a Supreme Court ruling effectively legalized cross-state bank mergers. Indeed in the 1980s, Atlanta became a hotbed for tech companies helping to automate small banks: Checkfree, InFront, Magnet Communications, Peachtree Software and larger companies that became the payments giants of today. First Data Corp. in the mid-1990s purchased First Financial Management Corp., a Georgia-born company. Global Payments Inc. was spun out of National Data Corp. in 2001. But one Georgia company tends to be cited above all others as a pure progenitor of activity in the transaction-processing space, and it’s not based in Atlanta. Now a publicly traded, $2.4 billion company, TSYS’s story lends credence to Mr. Yates’s view that software seeking a function combined with visionary expertise helped kick-start the industry in earnest. TSYS got its start as product inside Columbus Bank & Trust, a local bank in Columbus, Ga., that had set up a division to serve its own needs for processing the private-label charge cards it had been issuing to local merchants since the late 1950s. Phil Tomlinson, who had arrived at CB&T in 1974, said the bank had just gotten a new computer, and though everyone knew it would lend greater efficiency to operations, no one really knew quite what to do with it at first. Processing checks and card payments seemed the logical choice. With three programmers, the “Total System” software solution was born, and the company began selling it to banks around the region. It landed its first big customer in St. Petersburg, Fla., a bank with 65,000 accounts. That seemed huge to CB&T, which had less than $200 million in capital at the time. Things snowballed from there, as larger banks began seeing the value in outsourcing their card processing. “Once the word got out, people started showing up and we finally decided that we could be more successful selling the processing services rather than selling the software,” Mr. Tomlinson told Global Atlanta. When a $4 billion bank in Washington state contracted with the company, they knew it was something that could be a giant industry. “We actually had a board member that said, ‘Why in the world would a $4 billion bank in Seattle want to do business with us?’ It was a great question and the light bulb went off,” said Mr. Tomlinson, who retired as CEO of TSYS in 2014 after more than 30 years with the company. CB&T’s leaders, on their way to creating the banking network that would become Synovus, gave the company the latitude it needed to invest in technology and personnel for growth. The company was spun out as a public entity in 1983, early for a payments company. At the time, it had 1.5 million accounts, and Mr. Tomlinson they would have been thrilled with 5 million. Today, after more than 30 years of experience including an overhaul of its core software, a landmark decision to keep Columbus as the headquarters and a steady international expansion, the company processes more than 750 million accounts from Dublin to Dubai and Jakarta to Johannesburg. That has led to nearly 5,000 TSYS jobs in Georgia and 11,000 globally for the company, which shows how the sector can use its historical position to drive future technology growth in a area ripe for innovation. It’s taken decades, but a juggernaut that gradually developed over time is finally throwing its weight around, lest the hub developed so assiduously here pack up for another connected city. “I think they’re finally starting to recognize that the payments business in Georgia is big, and a lot of people just don’t recognize it because they’re not names like General Electric or some the Fortune 500 companies, but they’re names that employ a lot of people,” Mr. Tomlinson said. More than 40,000 — to be more specific — and counting. Author’s Note: Why Payments, Why Now?